Yesterday we had a meeting at work and I agreed to a story which, I have no idea what it was! I was so out of it yesterday. The night before had been one of those nights when I just could not sleep. Then I got up at 6 anyway because morning is my Leonard Pennario time and I do not like to give that up. So I got up and worked on my book for two and a half hours and after that I was kind of floating through my day. La la la la la la la. Days without sleep are better if you look on the bright side, I learned that in my two years as an insomniac. There are things it is fun to do on no sleep. One of them is go through Delta Sonic. 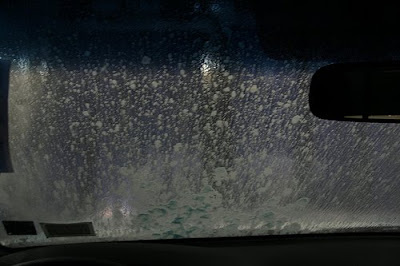 You sit there and watch all the soap and rags slapping against the car and it just moves you along and it looks like this. Once I had to go give a speech before a group of piano teachers on no sleep. At 9 a.m. That was an adventure! I wonder what I said! All I remember is I was so out of it that I did not even use any notes. Notes would have been useless under the circumstances. It is amazing, operating on no sleep! The experiences you have! Back to that meeting. We were all sitting there and suddenly I became conscious of everyone looking at me. "Mary would do a great job on that story," someone said. Someone else said, "Yes, that would be perfect for Mary. She would make it good." And I love flattery! I think that was what brought me out of my fog, that someone was flattering me. And I opened my eyes wide for the first time yesterday and I heard myself saying, "OK, I'll do it. That sounds like fun!" Uh ... what sounds like fun? This morning I am awake and suddenly I am wondering. After a day on no sleep you have to go back once you have slept and assess all the damage. One thing was the Web log post I wrote lastnight. Hahahahahahaa! Parts of it made no sense! The other thing is that story. Agreed, a day after a sleepless night is no fun at all. The only thing worse is having to get up to an alarm after that sleepless night. Invariably, what happens, is that we are just beginning to sleep well when the evil clock alarms! As I have said before, and it was no joke, that is the reason I retired at age 50. It is cruel and unusual punishment to me to have to wake up when I want to sleep. BTW, I sleep about 6 or 7 hours/day but, I definitely sleep them when I choose!